We have moved! Make sure to visit us at our new location. We also now open 30 minutes earlier at 7am Monday-Friday! Chip attended Wright State University as well as attending numerous HVAC schools. He has been to almost every 2J Supply class there is. 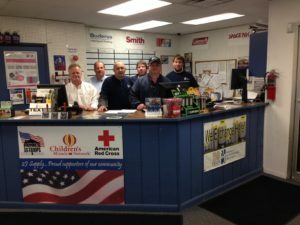 Chip has been in this industry for over 30 years, working his way up from the warehouse to the counter to outside sales before becoming a branch manager. He was a branch manager at the Cincinnati branch for 12 years previously. His favorite hobby of all time is soccer and he has coached high school teams as well as club. Chip’s favorite TV show is anything on the food channel. State of Ohio, OCILB: Lic. #31488 HV (in escrow). Lead paint RRP certification & EPA Lead-safe certification. Completed OSHA 30-hour safety training. Darl joined 2-J Supply in September, 2010. A year later, in 2011, he was named 2J Supply TM of the Year. Darl started in the HVAC industry in 1992 and has a multitude of experience. Previously, he has held positions such as General Manager, Service Manager, Project Manager, and Outside Sales & Marketing. Some of his hobbies include motorcycle riding; he is a member of the Harley Owners Group. He also enjoys camping and concerts. Darl has been married for 25 years and has 2 children.